Site Feed up and running – I think? For a while now I’ve been thinking of setting this blog up with a site feed. Blogger’s automatic atom feed wasn’t publishing correctly, perhaps because I host this blog on my own hosting, but I believe I have it sorted out now. 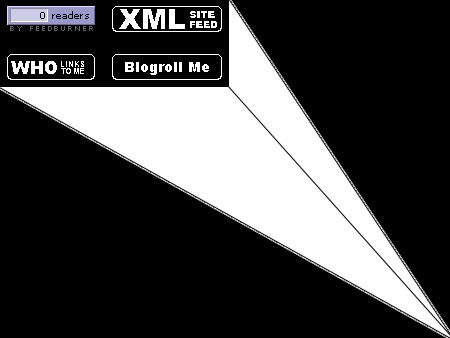 Using Feedburner and blogger’s automatic atom feed publisher, I’ve set it up so that you can subscribe to the feed using RSS or Atom, and using any reader out there (at least, that’s what Feedburner says). I still don’t understand the technical aspects of RSS and Atom feeds 100%, so if anyone finds any problems with my feed, please let me know. The WHO LINKS TO ME icon shows sites that have links to me – right now, there are a few blogs and a bunch of search engine results, but hopefully that list will grow to a lot of blogs and a few search engine results; my lack of reading other people’s blogs recently has not been particularly helpful in getting my blog publicized, but I’m working on better time management. As for the BLOGROLL ME icon, if you don’t already know what BlogRolling is about then check out www.blogrolling.com. It’s a pretty sweet concept – I can add links to my blogrolling list when I visit them online instead of having to manually edit my template. Extremely useful; too bad the free version is limited to 1 blogroll, as I could use a 2nd one.